This is simple and for such a good cause. To give boys and girls their own story in a pillowcase. If you're interested, check it out here. And if you want to see a quick and EZ tutorial on how to make a pillowcase, check it out below. Guess what the word of the day means. Flummoxed means to bewilder, confound, confuse. Willamette Writers kicks off their second Script to Screen short screenplay competition. Scripts are due on March 15th. If you want to read more about it, check out this blog. on Friday, August 2nd at the Willamette Writer's Annual conference. The deadline for submitting a script is March 15th. Guidelines available here. This is my husband zipping up his jacket (on the inside). Okay so I can admit it. I make mistakes. But sometimes I think...DUH! How the heck did I do that? Well let me tell you about this one. My husband got a nice new jacket for Christmas. It was a thick, warm, hooded sweatshirt material (which means cozy) jacket that he love(d)(s). Unfortunately, after wearing it a couple of times, the zipper broke. So, in his mind it was pretty much useless. But, being the eternal optimist that I am, I thought I can fix that. Now, mind you, I haven't sewn any zippers for quite a while...meaning dozens of years. Oh, I know, I sew. But my sewing is simple...straight sort of lines. Nothing quite compares with seam ripping the once perfect material and then trying to alter, replace and repair some notion. But, like I said, I thought I can do that. "Sew" I did, well, sort of. I ran to the fabric store and bought a new 28 inch zipper ($9.00 but I had a 50% off coupon so it was only $4.50), then I ripped out the old faulty zipper with my handy-dandy seam ripper and pinned the new zipper in place. He couldn't either...until the next morning. Then he thought...what are the pockets doing on the inside? Yeah, it makes him look a little chubby with all that extra material (the pockets) sticking out -- on the inside. Yep, I sewed the zipper on the jacket (inside out) YIKES! Yep, see that...it's inside out. But on the other side :( See the ribbed material...that goes on the inside - not the side people see. If you want to make a simple treat for St. Paddy's Day, here's the way to do it. Make a batch of cupcakes. Then take coconut and mix it with frosting, add a couple drops of green food coloring to the mix and blend until smooth. How 'bout a little Green? This is a simple way to decorate for St. Paddy's Day. Take a long pipe cleaner and a foam shamrock, twist the pipe cleaner around the base of the shamrock and WAH-LAH! You've got the beginnings of a beautiful green bouquet. I stick these into flowers out on the porch and even into centerpieces for the table. I think they add a great little pop of color. A 10-Day Community Festival or as they say it an "Urban Permaculture & Grid - Transformation Festival hoping for awakened social ecology in Portland Oregon"
What this is, is a festival to get volunteers together and to help neighborhood communities learn how to participate together in "spaces and places" or planned events. The theory is if you build it they will come. Or...if you give people a space to come together, they will make a memorable "Place". I thought this was a cool idea, kind of like building community gardens or parks. We've been eating a lot of sweets lately so when my hubby's uncle's 88th birthday rolled around I thought, why not fix something healthy...? I used my cookie cutters to cut out shapes in fruit: honeydew, cantaloupe, and pineapple. Then I stabbed shish kabob skewers through the fruit and decorated them with maraschino cherries for an extra pop of color. I put them in a vase to finish off my fruity "flower" arrangement. Just the Wind was part of the 36th Portland International Film Festival and was inspired by a true story. My sister and I went to see the show on Sunday night. This was a Hungarian film that won the Sydney Film Festival Jury Grand Prize at the Berlin Film Festival. The film used local villagers rather than professional actors, which I really liked. The people were not photoshopped, digitized, make-believe beauties. These people were real everyday people. The film tracked the three leads by using a roving camera in a Gus Van Sant sort of way, which made the show very naturalistic. It was the story of hate for an entire group of people: the Roma Gypsies and is based on real ethnic tensions in Hungary. If you want to read more about some of the murders of these people, you can read this TIME article. Just the Wind is the story of a Romany family's last days. They were hoping to escape the ethnic tensions into Canada but never made it. The mother was a hard-working mom, who worked two jobs to support her two children. The show depicted her daily struggle just to survive. She would get up early, feed her sick father, check on the kids and then be off on the bus to her first job. After working all day, she'd hurry off to her second job then home to take care of the kids and begin the process all over again. The authorities turn a blind eye to their persecution. Six families are murdered, not because of anything they've done but only because of their ethnicity. It was a slow-moving show, following the characters around in their daily lives (which was rather mundane). But this highlighted the poverty and depressing circumstances. In the end, the grandfather, mother and sister end up dead - having been shot in their sleep. The only one to escape is the son, who ran out of the home and hid. All-in-all it was a very depressing film but I think it did a good job of exposing the ethnic violence in a horrific way. Last night I had a little party and not everyone was a couple so I wanted to include everyone in the holiday of love and who can't use a HUG? 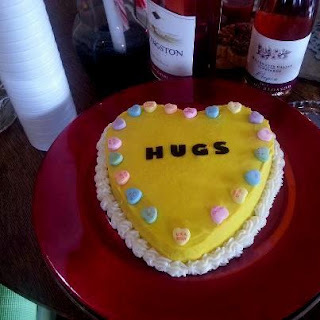 Everyone wants to feel loved and cared for and a hug is just that, it's a simple little gesture that says "Hey I care about you" and I just happened to give mine in the form of a sweet cake. And this simple little cake only cost about $2.50 to make. I baked the cake and made cream cheese frosting. 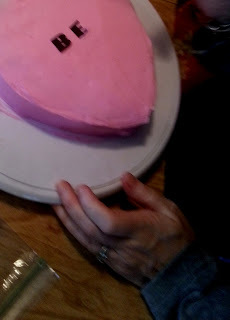 The word was made from edible fondant and then I decorated the cake with conversation hearts. The piping around the bottom was the same frosting as the yellow - only of course without the food coloring. I'd practiced making these cakes ahead of time. I always like to practice first. It's easy to see where I need to add a little extra time and effort. And I think the second time it's easier and comes out better. 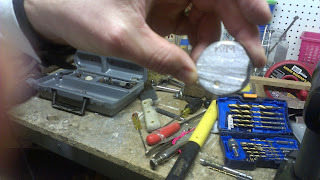 Plus finishing details make all the difference...can you tell...? 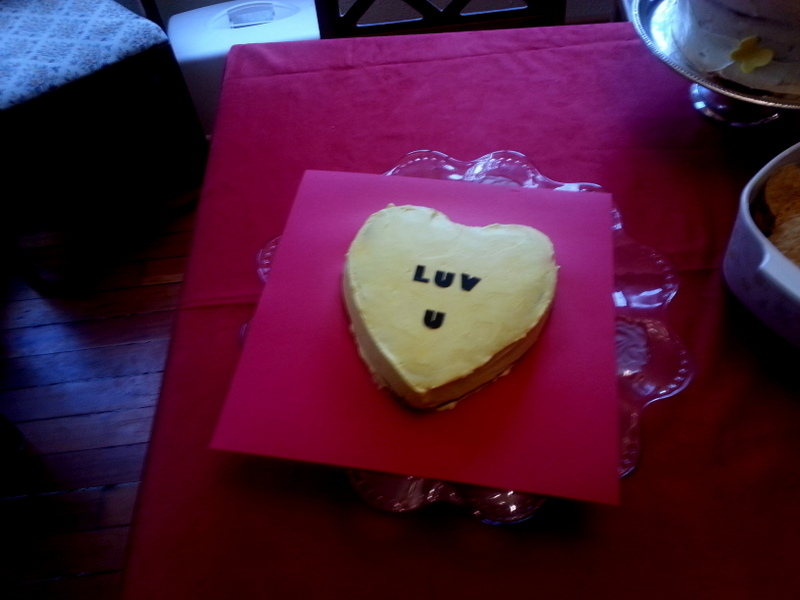 The only change I made in the recipe with the cakes from Valentine's Day was I added banana. I had an overripe banana waiting to be made into banana bread and I figured ("why not") so the ones on Valentine's Day were banana cakes. Plus, I love fruity flavors and bananas bake so well. 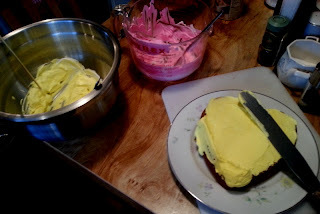 While the cake cools, I separate the batch of frosting into three bowls: one for pink frosting, one yellow and one to be left white. I frosted the cakes then added the words and conversation hearts. 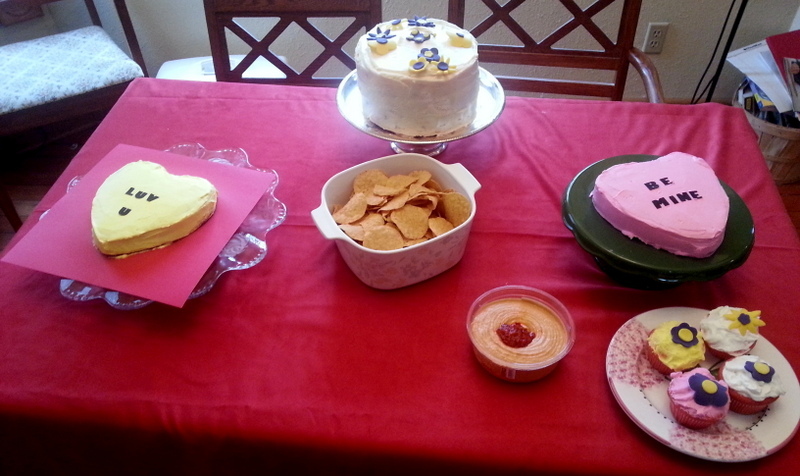 After the cakes were finished, I placed them on their cake stands and piped the edging. 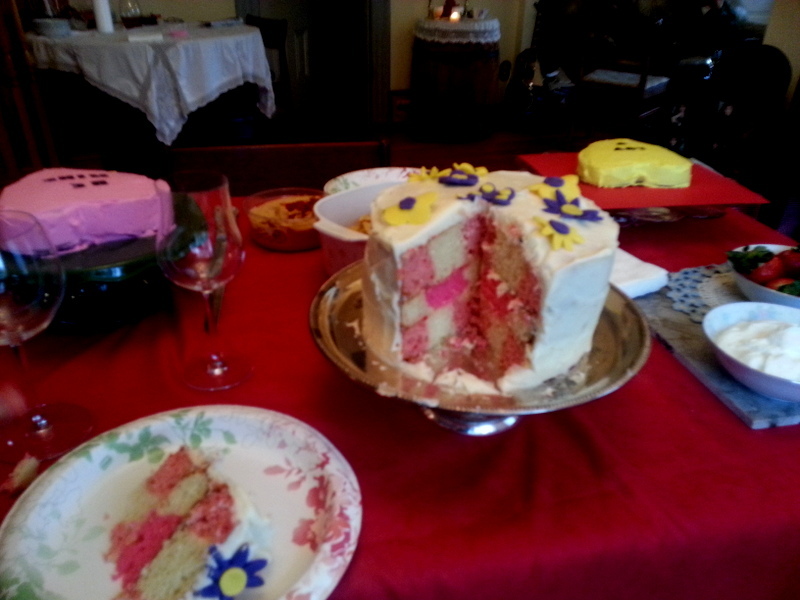 The decorations and piping are great for hiding flaws - like raw edges. 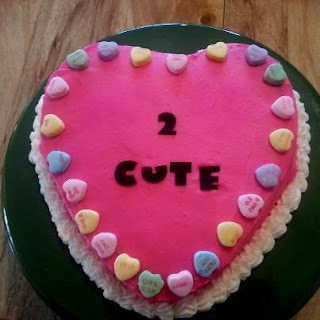 I pushed the fondant words in a little too hard - it made the letters indent the cake - so be careful about that. How 'bout you...have you done any Valentine's Day baking? Mardi gras is French for Fat Tuesday, which is the last night of partying before Lent begins (which is a time of fasting and religious practice) on Ash Wednesday. New Orleans is the most famous city for Mardi gras because they go all-out with the celebrations. If you're interested in celebrating in Portland, Oregon you can find a list of events here. And if you're interested in making your own Mardi Gras mask, check this site out. I went to the 36th Annual Portland International Film Festival to see this story which was based on a real-life case of supposed demonic possession. The lead actresses Cristina Flutur and Cosmina Stratan received the best actress prize at the Cannes Film Festival and their performances were very well done; however, the film was 150 minutes and I think it could have been done in 90 minutes. 150 minutes is just tooooooooo long for me to sit and watch most any film. In fact it's the reason I haven't gone to the new Lord of the Rings show - yet. I can't stand sitting still that long. But aside from the length of the film, I was also hoping to be sitting on the edge of my seat...at least a few times during the show. I wasn't. This was a slow moving drama that was more about strict religious dogma than demonic possession. Cristina Flutur was a strong-willed young woman who cursed at the priest because she was frustrated that her girlfriend would not leave the monastery, where she was training to become a nun, and return with her to Germany. If everyone who got frustrated with religion and priests and then swore were demonically possessed, it would leave very few non-possessed people in this country. So, overall I thought the film was interesting...the acting well-done, but the film was too slow and long for me. I love to bake and I was having a "Welcome to the Neighborhood" party for some new neighbors so I figured why not combine the two (or maybe) three things: Valentine's Day, Baking, and Welcome! 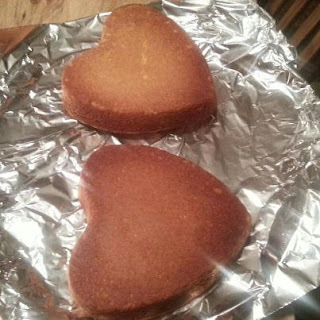 First I baked a couple of heart shaped cakes. Then I made some whipped cream and colored it pink and yellow with food coloring. 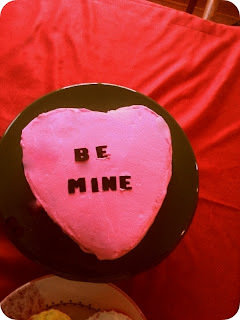 Then I frosted the cakes and put fondant words on top. yeah, I tend to go overboard on things. I'm having a neighborhood get-together this weekend and so I wanted to practice on some more goodies to serve. 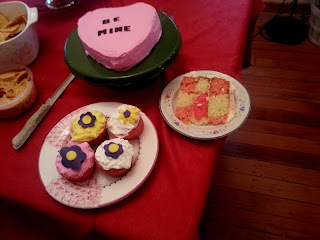 This was my idea: Valentine's Day Cookies that look like real Valentines. 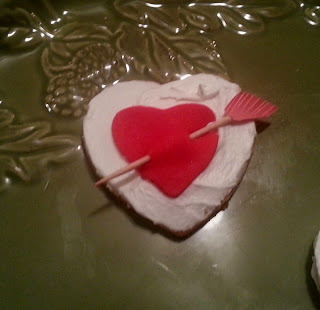 So, I used my Royal Icing for the white frosting and then I cut out a bunch of red fondant hearts and stabbed them with toothpick arrows. I "glued" the fondant hearts onto the cookies with the frosting. I thought they turned out cute. March 16, 2013 The SCBWI Oregon will be having a Prepare Yourself Workshop to help everyone get ready for the May conference. What to Expect at the Conference is FREE! No refunds after March 9th. Registration will be closed on March 13th. This was our book club choice for the month of January. Clive is my husband's favorite author and I have never read one of his books until now. I really didn't expect to like it at all because I don't like action/adventure movies or books but this was more fun than I thought it would be. It was a quick page turner and I had no problem getting through it. Although I do think Dirk Pitt is totally unbelievable. I mean he's like a Navy Seal on Super-Steroids. No one could do all the things he did, including fighting a bull. I mean, I think being a matador might take a little training rather than simply hoping into the ring and waving a red cape around. But never mind all that, it was an exciting story. And I did like the fact that Dirk included his kids in the story. Of course they were Super Seals too but what the heck. How else can you save the world and a super-stealth submarine at the same time? Anyway, this was a new genre for me and now I'll know what my husband is talking about when he talks about Summer and Al and Dirk, Jr. So all in all, if you're an action/adventure kind of person and if you enjoy James Bond, I think you'd love Poseidon's Arrow. Sprinkle powdered sugar on the table and roll out the dough to cut into shapes. Bake on greased cookie sheet at 350 degrees for about 8-12 minutes. This is a smooth, hard-drying icing. Beat Meringue Powder, sugar and water until icing forms into peaks. All that glitters isn't always gold. At least in my book, glittering gold isn't always the best. I wanted to run not try to balance on high heels. I wanted to climb not curl my hair. My mom was a beautician and she was always styling my hair, which I would pull down out of it's fancy "waterfall" style, when she wasn't looking, and let it get tangled. Guess that's why I still only have one pair of high heels and they aren't even that "high" and when my husband buys me jewelry I kind of sigh and say, "do you want me to put that on?" I hate changing jewelry and I almost never wear earrings. 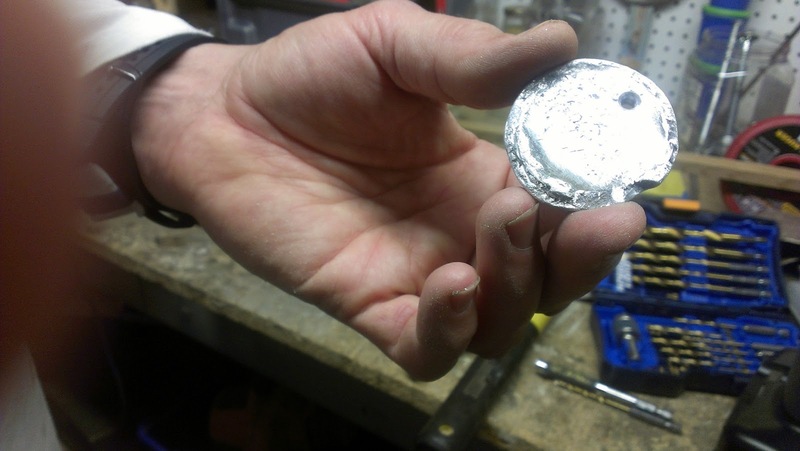 BUT when my husband brought home this funny aluminum "coin" he found when he was out jogging on a business trip, I said, "wow. That's really cool." 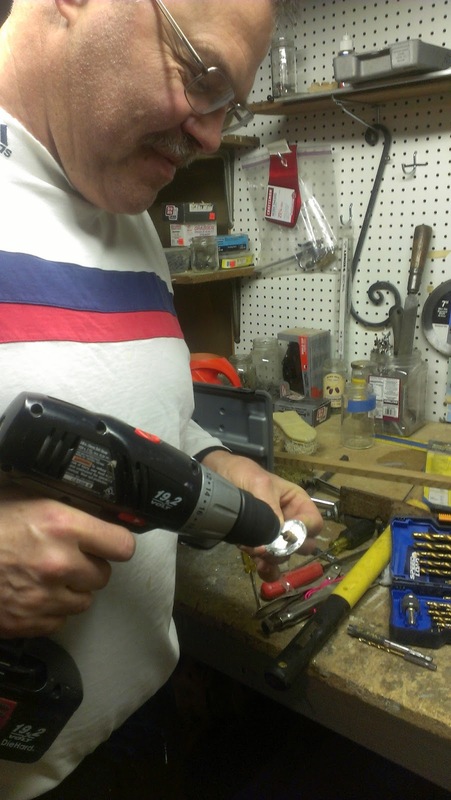 The next thing I knew, he was drilling a hole in the scrap metal and making me a necklace. 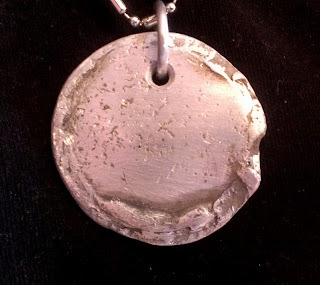 And isn't this necklace cool?You can even see it from a distance. So, I guess I'm a cheap date...or at least a cheap wife. I don't ask for diamonds and pearls. I like scrap metal and salvaged aluminum. He drilled the hole in the metal. Then he engraved "Kim and Lars - 30" (because this is the 30th year we've been married). 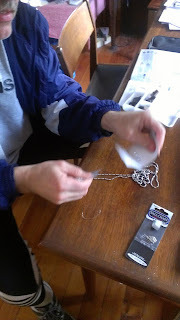 Then he clamped on an "OH" ring through the hole and inserted a chain to make it a necklace. The "OH" ring only cost $1.99 for about 50 of them and the chain was $2.99. So, it was less than $5.00 for the entire necklace. Pour your sprinkles on top - the warm white chocolate will act like glue for the sprinkles. Oh yeah, make sure you have wax paper underneath the cookies - it will help so much with the mess. You'll simply be able to throw it away. Then pop your pan in the fridge to chill for about a half hour. Make sure you put wax paper between the layers of cookies inside the box so they don't get stuck together. These are two loaves of bread, baked in the same oven, at the same temperature and using the same recipe. The only difference: one package of yeast was obviously faulty. I tried to make the loaf on the right-hand side better by drizzling honey over the top--it was no no use, no hope and terrible. I had to throw the loaf away, well I composted it. I didn't even want to give it to the birds--it was soooo dense I think they might have broke their little beaks trying to chip away at it. It was hard as a brick. I know, it looks like a flat, gooey, YUCKY mess - and it was. My whole point of this post was to tell people that sometimes you can do everything right and still everything go can horribly wrong. I know people who have baked one loaf of bread and then "never again" because that one didn't turn out. Well, it could have been a simple fix - the yeast. Seriously. The same goes with writing. I know lots of writers who have written a story, sent it out trying to get it published. Then they've gotten a few rejections and :( gotten horribly discouraged. They give up before they've even given themselves a chance. Sometimes you have to rework a recipe (story) and move things around. As you perfect your craft you'll only get better. And who knows it might not even be your fault that it isn't picked up. It might be that it's "just not right for the list," "it doesn't suit the needs," or it could even be personal taste. You might make the best lemon meringue pie in the world but if the person tasting your pie hates lemons...well, sorry charlie, it's not going to be picked up. That doesn't mean you should give up. The next person who tastes your pie might think it's the best thing on the planet. It's the same with stories. I LOVE Stephen King's novels but none of my girlfriends will even read his books. I know, It's hard to believe but it's true. I'm in two book clubs and I have been recommending S King books over and over again. Finally, my girlfriends said, "Kim, we are never going to read Stephen King. We are single ladies who live alone and when we curl up at night it's not going to be with a ghost, ghoul or serial killing maniac." That got me thinking...tastes can be so different and sometimes things can go horribly wrong...even when you do everything "write" ;D But keep at it and you'll only get better...at baking and writing.